National age-group striker, Dennis Ifunaoa, bagged a hat trick to take his league tally to 10 goals when he struck in the 30th, 38th and 40th minute. His fellow Mamula teammate, Tigi Molea, added the fourth goal in the 49th minute to take the game away from their opponents. Real Kakamora’s only goal of the match was scored by Rex Honu in the 76th minute. The match was played on a wet Lawson Tama surface and this proved to be costly to both sides. Real Kakamora, of course, found themselves on the wrong end of the score line after their quick passes were made impossible by the wet surface. For Solomon Warriors, the game cost them their number one goalkeeper, Alfred Ali, who was red carded for denying a goal scoring opportunity in the 76th minute. A powerful surge in the second round pushed Solomon Warriors clear from KOSSA and Western United who were also hoping to finish in second place if not overtake Koloale. The club management provided additional incentives to its players to get more wins and this worked magic as they raced to the finish line with 6 wins and 1 draw from their 7 second round matches. They also have the record of being the only team to defeat Koloale. Kidston Billy led the charge for Solomon Warriors’ resurgence inspiring his team mates to go for goal more often but the inclusion of Carol Kakate was also an important catalyst. Kakate had the ability to cause havoc on opposing defences and this freed up his team mates to focus on getting the goals. The work Mark Prove has done on defence for the team has also made a difference with the backline now looking more organised and more involved in shaping their offensive game. 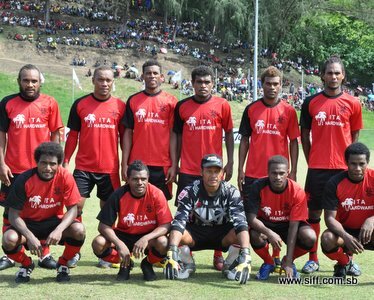 Being the only club that has reached the grand final of a local qualifying competition without making it to the O-League winning the TSL championship stage will be Solomon Warriors’ next goal. This would force Koloale into the O-League playoff with them. To do this they have to first win past their home-and-away series against a yet to be named opponent in the championship and finish on top after the finals. Solomon Warriors’ strong finish in the league will be an early warning for their opponents in the championship and for their players it is an important morale and confidence boost. Competition in the championship will be at another level but surely, Solomon Warriors, will be up to the task.